Better burn, better heat output, cleaner for you chimney flue and your wood burning appliance. Quality hardwood logs are used for many reasons, mainly because you want the best heat output, and making your home warm and cosy. Using kiln dried hardwood is better because of the density of the wood and takes longer to burn. Softwood comes from gymnosperm trees, pine, cedar trees with needles, cones or nuts. It burns so quickly so it’s not economically useful. Customers has their own preference when burning firewood. Oak logs burns longer with great heat output and the smell is strong when burning. Beech logs very rarely spits and has good long-lasting embers and great heat. Ash firewood has good heat output compared to birch. We don’t sell birch firewood as we don’t believe its economical for our customers to use. Dry, clean wood fuel and oxygen. What we mean by dry wood is that it has a low moisture content. Typically, the moisture content should be below 20% in the UK. Timports logs are typically between 10% to 18% GUARANTEED. This is done by using a huge oven called a kiln. Wood drying kilns uses heat/air to dry the wood. Different species of wood needs different drying times. The density of the wood, the thickness/size and the initial water content of the wood needs to be controlled with the air temperature for many hours. 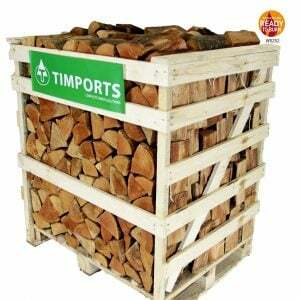 The product is very dry kiln dried logs/firewood with no insects or mould. Properly dried logs are lightweight. Some of our customers has suggested keeping their logs near the fireplace. They are dry and lightweight so handling them is easy, especially the nets. 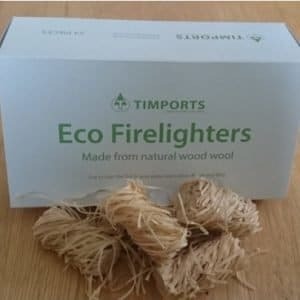 They start with our Eco-firelighters, then a few pieces of kindling. Place the kindling either crisscross or like a tepee over the firelighters. Once the firelighters have caught, place your beech logs over the kindling, after a good hearty fire starts, add the king of firewood, oak. Your fireplace will have a lovely glow, will last for hours, and you will feel the heat and warmth. When cooking with firewood the smell enhances the flavour of food. Different species of firewood has difference characteristics for cooking. Oak used for smoking, gives an intense flavour. Beech wood has subtle flavour because there’s little smoke and doesn’t normally spark normally used on BBQs and in bread ovens and a great wood fuel for pizza ovens. Timports firewood is stacked in crates and left in the kilns to dry out overtime. Perfect firewood ready for immediate burning. Kiln dried wood is the best firewood, sustainably source from our European partners and UK wood suppliers. Our kiln dried logs for sale are sold in 2m3 crates, 1.2m3 crates and nets of beech logs. The log length is roughly 10in (250mm) and should fit most wood burners. fire-pits and open fires we believe our service is second to none and our wood is of high quality. When we receive your order, your kiln dried logs are stacked on a pallet, which can also act as a log store. The wood is wrapped whether you buy large crates small crates or nets of logs. This helps keep your firewood dry and in place. When you receive your logs, they are ready to burn, if you’re not burning them immediately store in a dry area. All our firewood is hardwood firewood, no softwood, alder or any other lesser wood.